Spraying the conditioner directly onto my hair does very little, so I prefer to spritz it into my hand and then re-scrunch my (dry) hair. Used this way, my curls are redefined with minimal frizz, and my hair look ALMOST as good as day one, freshly washed hair. The spray is not at all heavy or oily like some other leave-ins. Instead, it just imparts a very light dose of moisture. If you're looking for something heavier, this might not be the product for you, but I like that you can go to town, use a good amount of product, and not have to worry about ending up looking like a total greaseball. In the interest of full disclosure, I should mention that my first impressions of this product were not very favourable. I used it once or twice without noticing any difference, hated the smell, and despondently added it to my small pile of products to give away. As it turns out, I couldn't quite bring myself to get rid of it, and many months later I pulled it out and decided to give it another try. For round two, I figured out how to make the product work in my hair, but the smell is still not a favorite. It's a lot heavier and more herbal than the bright lemongrass scents I'm used to, and I just don't love it. It also lingers, so I'll catch fairly strong whiffs of it throughout the day. It's kind of a hit-or-miss thing for me - some days I'm okay with the smell, while others it drives me crazy and I can't wait to jump in the shower and wash it out. Bear in mind that if you're less sensitive (and/or fussy) about smells, this may be a moot point. 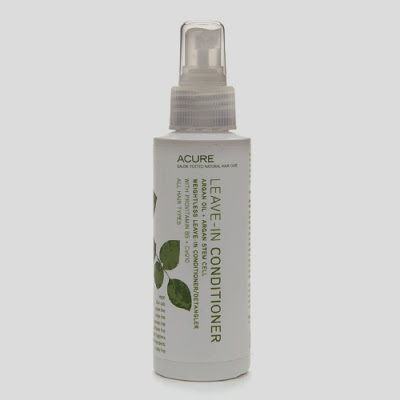 I love how well Acure's Leave-in Conditioner works as a curl-refresher, but I wish it smelled different! As it stands now, the smell takes this product from something I'd use daily and happily repurchase to something I cautiously use on occasion and likely would not buy again. Where to Buy: $7.73 from Vitacost, 8.62 from iherb, $9.99 from Acure. How much does smell factor in when you're choosing products? And, if you have any amazing tips for second-day hair, I'd love to hear them too! I've just recently started using this & I'm not using it like you are so my feeling so far are different (still in new stages). Our hair types are different, straight and I'm mainly using it on wet hair as a detangler on both my daughter & myself. It works for that purpose like a charm and after drying I haven't noticed the scent at all. Most likely our different experiences is due to how we are using the product and our hair types. I hope you find something you love. I'm glad it's been working so well for you and your daughter :) I really do like everything about this, except the scent. Funny how you haven't even noticed it! Smell is definitely a factor for me--if I dislike the smell I don't care how amazing the product is, I won't use it! However, weirdly enough, I like strong earthy scents like lemongrass and patchouli, which most people hate...so maybe this smell wouldn't bother me. So true! I usually don't mind earthy scents either, and some lemongrass I really like...this one just isn't doing it for me! Thanks! Too bad it didn't work for you :( I don't notice much in the way of conditioning either, but I like how it makes my curls look almost good as new again. I know! I was hoping I'd stop noticing it after a while, and I could deal with it if it only smelled when you first use it, but it's the smelling it all day part that gets to me! So true! I love the almond smell so much now :) I just bought the mint ones to try also and they smell great too!